Move over old space glue, here comes something stickier. A new adhesive with strange properties could make sticking stuff together a little easier in outer space. This Velcro-like adhesive isn't as strong as comparable glues found at the hardware store, but it has a unique stickiness in dry environments. On a spaceflight, for instance, astronauts could use the new glue to replace any tiles on their spacecraft, should it have them, researches said. The adhesive even could even be used as the trigger in a moisture-detection device, they added. The glue is made up of peptides – chains of amino acids naturally found in the body – that become sticky when their pH reaches a level of 9. The pH scale measures how acidic a substance is, ranging from 0 for very acidic to 14 for very basic. 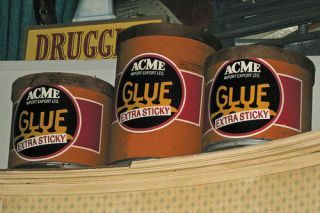 Most glues get brittle and crack when moisture is removed, but this one gets stickier, Tomich told InnovationNewsDaily. "It could be used as a timing device or as a moisture-detection device," Tomich said. "There could be a circuit or something that, when the moisture got to a certain level, the adhesive would fail and break the circuit, sounding an alarm." Tomich says the glue is ready for prime time but just needs a buyer.